Zak Fleming and Marc Black announced today that they are forming a new partnership, teaming under the Fleming Construction LLC masthead and doubling down on the remodeling contractor’s commitment to Central Iowa homeowners. Fleming and Black share a unique vision for a service-oriented approach to transforming kitchens, basements, bathrooms and entire abodes into the space of homeowners’ dreams. With a combined 40 years of professional experience serving those in need of qualified building and remodeling services, they have a track record of collaborating closely with industry peers to promote learning and career opportunities in the construction trades. 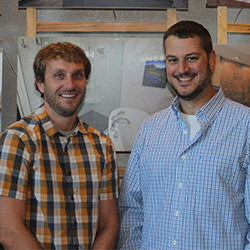 Both men are past chairs of the Remodelers Council of Greater Des Moines, have earned Certified Graduate Remodeler (CGR) designations from the National Association of Home Builders (NAHB), and were honored nationally by Professional Remodeler magazine as prestigious 40 Under 40 awardees – Fleming in 2014 and Black in 2015. Citing strengthening U.S. economic conditions, tight for-sale inventories and healthy home equity gains, the Joint Center for Housing Studies of Harvard University projects that homeowners over the coming year will spend more than $330 billion on home remodeling activities, including upgrades, replacements and routine maintenance. Fleming said he recognizes a trend in the Des Moines metropolitan area that reflects accelerating growth in the market as owners considering an improvement often choose to reinvest in existing real estate with the help of a professional remodeler. Black, who has earned COSC (Center on Sustainable Communities) Certification, as well as the designation of Certified Aging-in-Place Specialist (CAPS), joins Fleming Construction with 20 years of active involvement in the residential remodeling and homebuilding business. His portfolio of professional experience ranges from estimating, sales and fieldwork to project and production management. Fleming Construction was founded in 2001. The partnership will take effect January 1, 2018. Fleming Construction is a Central Iowa remodeling contractor with a unique vision for remodeling kitchens, finishing basements and transforming bathrooms into the space of your dreams. From sunroom remodels to whole-house renovations, we like to sit down and have a candid discussion about our customers’ expectations for a project, as well as their budget. We are committed to installing only the best-quality materials that sustain a high-end appeal even under everyday family use. To learn more or schedule a consultation, go to http://www.flemingconstructionllc.com.